It's February, which means only one thing to me. Birthdays and I have had a love affair since I was knee high to a grasshopper. There's just something magical about them. And the celebration? Oh, there is so much to celebrate. For one thing, it means you've survived another year on God's green earth. Another year of happiness, heartbreak, disappointment, gratitude, acceptance, appreciation, love, loss, new friends - the list goes on. It saddens me when I hear someone say they don't, "celebrate my (their) birthday anymore". It leads me to wonder at what point in life or what happened to make them feel this way. I mean, who doesn't enjoy a extra pouring of love? In fact, it's the one day I allow people close to me to make as big a fuss as they want. I really do adore all the love I get from phone calls, emails, texts, through the post, even on social media from people I've never met in real life. People that took the time to send me happy thoughts and warm wishes fills my heart to the brink of explosion. Birthdays are also another year to wipe the slate clean and start over, hopefully a little wiser and a lot stronger. And age? It's just a number, my friends. When I tell people how old I am, some will stand there in disbelief. Not because I don't look my age; I do, it's because I don't feel my age. I'm such a big kid at heart and I enjoy life, therefore I refuse to allow a number dictate how I should act of feel. So for much of the month, I'm going to share all the things I adore and recipes I love. Oooh. This is gonna be so much fun. Line an 8-inch or 9-inch baking dish with parchment paper, leaving some hang over the sides; set aside. In a saucepan over medium-high heat, melt butter, syrup, and chocolate together. Once all ingredients have melted, remove from stove and add in crushed digestive biscuits. Stir until fully incorporated. Add in malted milk balls and quickly mix together. Do not worry if the chocolate comes off of the balls. Any imperfections will be covered up prior to cutting. Place dish in the refrigerator and allow to chill for several hours. Once chilled, remove chocolate mixture from dish. Drizzle melted chocolate over top and alternate with malted balls to allow to stay in place. Place back in fridge to allow chocolate to firm up. Once set, cut into squares. This recipe looks absolutely delicious! This would make a great treat for those big family get togethers...or any time actually! If you have a World Market near you, they sell digestive biscuits. You can also often find them in the British section of your local grocery (usually higher-end grocery; I know my Harris Teeter has them but my Food Lion doesn't). Yayyyy!!! I love birthdays too! They ARE magical!! And so are these delicious looking squares!! So crunchy and sweet and ommmm nom nommyy! I agree, birthdays are special, each and every one of them. I hope yours is (was) awesome and that you have a fabulous year. 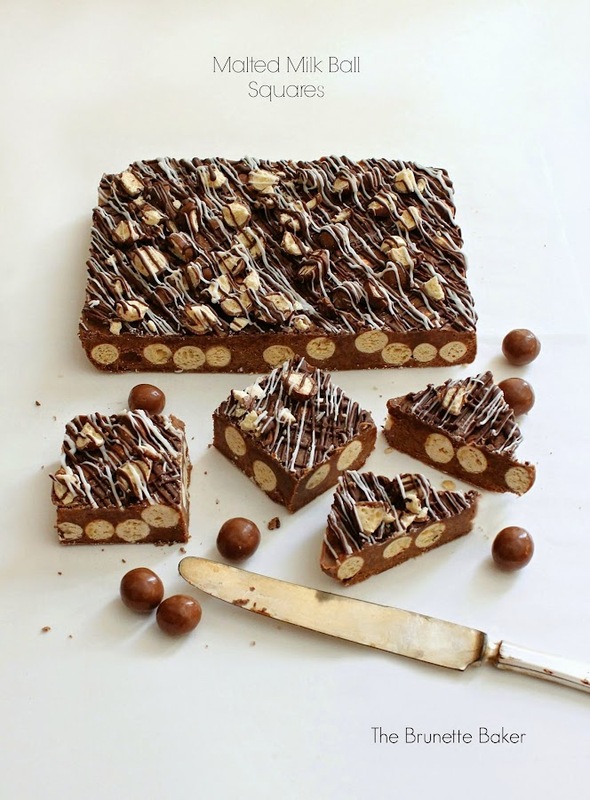 Malted Milk Ball Squares!! Such fun! I used to love these little treats when I was a kid and it's probably been since I was a kid that I ate them. Wow! These are amazing....my kids will love them!!! Pinning! Happy Birthday from one February born brunette to another! Pinned and will have to try soon. Happy Birthday month! :) These look delish. Thank you so much for linking this recipe up at Recipe Sharing Monday. I hope to see you back next Monday. Have a good weekend! Happy Birthday and holy moly! This looks delicious!! Thank you for linking up at Tasty Tuesdays! Your post has been pinned to my Recipes from Tasty Tuesday board. I can't wait to see what you link up next week! Pretty sure my kids would flip out over these! Thanks for linking up with What's Cookin' Wednesday! wow happy birthday to you and the rest of the Feb b-days! mine is the 12th! i just love the idea of this recipe so fb, pinned and can't wait to try it! (the reason some of us dont celebrate is maybe we dont have anyone that loves us enough to remember or care!) and yes age is just a #, i act far younger that my age! Oh. My. Word! These look amazing. I love Maltezers and digestive biscuits. I cannot wait to try this recipe. Thank you for sharing at Tasty Tuesdays. I am featuring it today at Red Cottage Chronicles! Is golden corn syrup just the same as golden syrup? Is simple and looks absolutely delicious! Will definitely make this!!! Thanks for sharing and you are a genius if you created this recipe! The presentation is so good too! Happy birthday dear!! This is looking so yummy.I'll definitely try on it for my birthday :) Thanks for sharing the giveaway.